They shook hands for the media before holding talks and having dinner at the five-star Metropole hotel. They are expected to discuss a roadmap for ridding the Korean peninsula of nuclear weapons in two days of talks. There has been little progress on that and other issues since the first Trump-Kim summit in Singapore last year. Mr Trump said he thought this latest meeting would be "very successful". He denied he was "walking back" on denuclearisation. Asked whether a formal end to the Korean War might be declared, he said: "We'll see." He said he looked forward to helping Mr Kim achieve a "tremendous" economic future for his country. 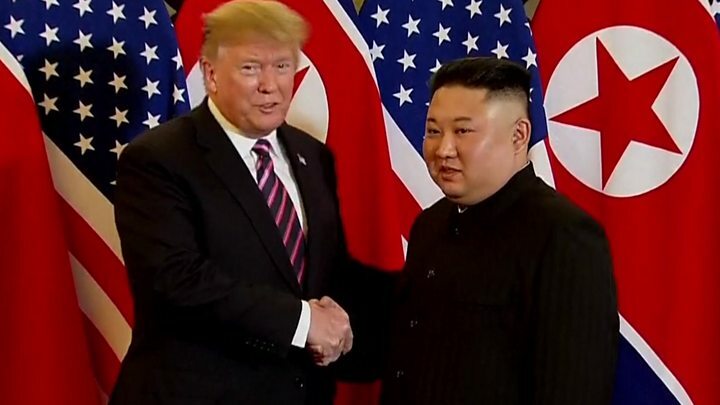 Mr Kim, whom the US president described as a "great leader", said he was confident there would be an "excellent outcome that everyone welcomes". "I'll do my best to make it happen," he told reporters, before the men sat down to eat. According to the Washington Post, four journalists were banned from attending the dinner - they reported for Bloomberg News, the LA Times, and the Associated Press and Reuters news agencies. White House press secretary Sarah Sanders said the number of journalists had been limited "due to the sensitive nature of the meetings". Earlier, Mr Trump tweeted in praise of the host country, writing: "Vietnam is thriving like few places on earth. North Korea would be the same, and very quickly, if it would denuclearize." "The potential is AWESOME," he added. The US leader and Vietnamese President Nguyen Phu Trong signed trade deals worth around $20bn (£15bn). The deals secured contracts for Vietnamese airline firms to purchase US made planes and technology. What's the Trump-Kim schedule looking like? Wednesday's meetings were limited to brief questions from reporters, one-on-one talks and dinner with aides. It's expected that any major events - the signing of agreements or significant press conferences - will take place on Thursday. The two leaders will attend a series of meetings together, but their exact agenda is unclear. North Korean state media praised Mr Kim for making the 4,000km (2,485-mile) trip, with state paper Rodong Sinmun dedicating four out of its six pages to it. It said North Koreans had reacted to his visit with "boundless excitement and emotion", and urged people to work harder to "give him reports of victory when he returns". The paper also added that his overseas trip had caused some of its citizens sleepless nights, with one woman telling a state broadcaster saying that she "really missed" Mr Kim. North Korea has been ruled since its creation in 1948 by three generations of the Kim family. The country has a woeful human rights record, and the UN says its people live under "systematic, widespread and gross human rights violations". Kim Jong-un carried out a brutal purge after taking charge of the country in 2011, ordering the death of his own uncle to secure his position. About 140 senior military officers and government officials were executed between 2012 and 2016, according to South Korea's Institute for National Security Strategy. The economy is tightly controlled by the government, with widespread shortages of food, fuel and other basic necessities as the state funnels funds into the military and its nuclear weapons programme. Reporters Without Borders ranks North Korea last in its World Press Freedom Index, with all news and information coming from state media. Why are the leaders meeting again? That meeting produced a vaguely worded agreement, with both leaders agreeing to "work towards denuclearisation" - though it was never made clear what this would entail. However, Mr Trump appeared to be managing expectations ahead of the summit, saying he was in "no rush" to press for North Korea's denuclearisation. Ideologically, both Vietnam and North Korea are communist countries, though Vietnam has over the last few decades opened up to foreign investment and emerged as one of the fastest growing economies in Asia.